"Preserving Bath County's Past for Generations to Come"
the history of Bath County for future generations to come. The Historical Society Museum and Research Library is located in Warm Springs, Virginia next to the Bath County Courthouse. The Museum building was originally a law office which was moved from the original courthouse located at the current Warm Springs Inn. 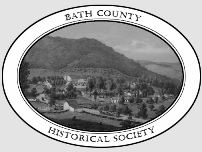 The items in the Museum have all been donated by friends of the Society who want to see Bath County history preserved for future generations. These artifacts are of interest to all those who visit, not only the local people, but visitors from all over the world. From antique side saddles, to period clothing, original historic photos, farm implements and tools, Civil War and Indian Artifacts, even a grand piano, there is something here to interest everyone. The Research Center and Library addition was completed in 1995 and contains a wealth of information for the researcher and genealogist. Included in the collection are materials and microfilm on Bath and Virginia history as well as information from West Virginia, Kentucky, Ohio and Tennessee. These along with family histories, both published and unpublished, have aided many visitors in their search for roots. The Society Gift Corner includes books pertaining to Bath County and area history as well as other seasonal items for purchase. Admission is free. Donations are greatly appreciated to offset operational expenses. The Society publishes newsletters each year to our membership. Histories of Bath County as well as family genealogies and queries are often included in each issue. Membership is open to anyone interested in being a part of this valuable preservation effort for an annual donation of $25.00 or more, per person. A call for donations goes out in August, followed by a Patrons Party at an historic venue in September to which all active donors are invited. You are invited to stop by and explore the history of our mountain villages and its people and discover life the way it used to be. Local school groups are also invited.